The green city movement continues to strengthen and expand, further emphasizing the need for green buildings. While there’s been a constant focus on sustainability in Architecture & Design for the last several years, the city-wide approach fuels these initiatives. With buildings accounting for a third of all greenhouse gas emissions, it only makes sense that cities are taking a closer look at their buildings. As green cities take sustainability to new heights, their leadership and willingness to share what is successful has influenced more and more cities to develop their own sustainability programs. A green city is simply a city focused on sustainability. As Scientific American noted, green cities “lessen their environmental impacts by reducing waste, expanding recycling, lowering emissions, increasing housing density while expanding open space, and encouraging the development of sustainable local businesses.” These cities are taking the basic tenets of sustainable design and putting them into action throughout their boundaries. Lowered levels of pollution, greater energy conservation, and renewable energy sources are a few hallmarks of green cities. Cities like Portland, San Francisco, Singapore, and Oslo are renowned for their high levels of sustainability. These cities have quickly and effectively implemented greenness into their local cultures, resulting in high percentages of residents who contribute to their hometown’s sustainability. For example, in 2014, San Francisco recycled 80 percent of its trash. Many green cities have also funded various energy-conserving resources and structures. In São Paulo, Brazil, thermoelectric power plants reduce methane emissions. The plants also produce clean energy and fulfill 7 percent of the city’s electricity demands. In addition, many cities are going above and beyond typical sustainability measures. 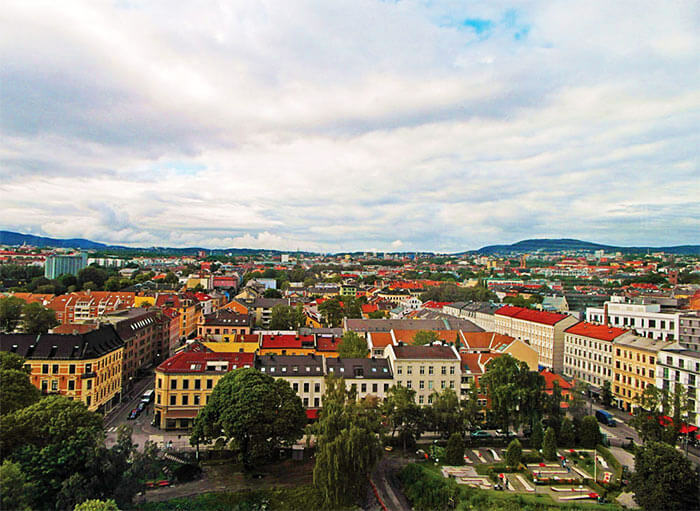 Oslo, for example, requires all municipality-built structures to be both zero-emission and energy positive, meaning that they generate energy while releasing no pollution into the atmosphere. These energy positive cities lessen their environmental burdens while completely sustaining their inhabitants. These cities’ superb environmental friendliness is due in large part to sustainability measures, but design is also proving to be a critical factor. Utilizing sustainable design for homes and skyscrapers alike, these cities are innovating with their approach to building new structures. 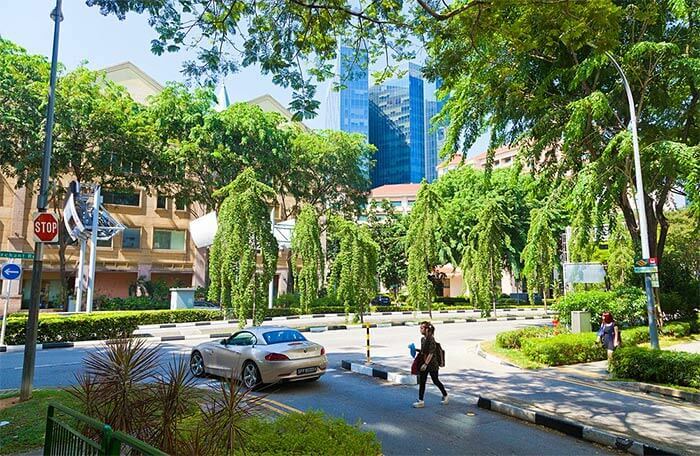 In these green cities, built environments are rejuvenating for both occupants and the earth, and they look fantastic to boot. From TerraMai: HOK Chicago’s sustainably designed office resides in one of the greenest cities in the U.S.
Chicago, affectionately known for its big city hustle with midwestern charm, now has even more to love about it. A study by CBRE and Maastricht University named the metropolis the cleanest city in the U.S. to work in. That’s because roughly 70 percent of Chicago’s office real estate has been certified for environmental efficiency through programs like LEED and EPA’s Energy Star. Take a peek into some of Chicago’s offices, and you’ll see why the city earned such high praise for sustainability. 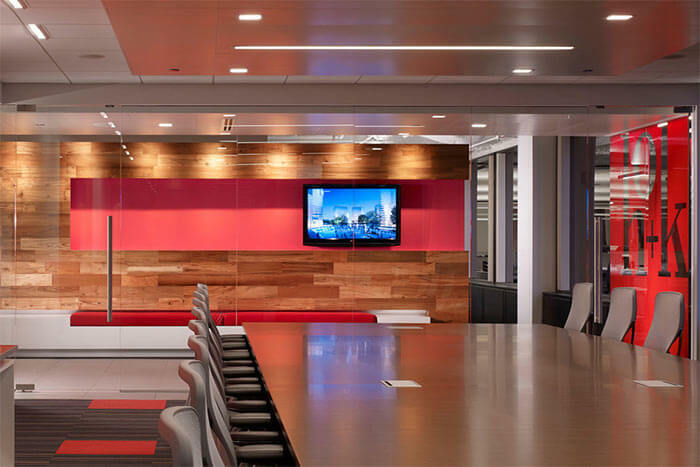 Design firm HOK’s Chicago office is an excellent example. It was designed with sustainability in mind. Notably, the office earned LEED Platinum certification thanks to its use of natural building materials like reclaimed wood. This focus on sustainable design is a noteworthy component of Chicago’s movement toward increasing environmental health. Moreover, in recent years, Chicago has taken large strides to become greener. The city reduced its carbon emissions by 7 percent from 2010 to 2015 and continues to make recycling easier for residents. However, this is all just the tip of the iceberg for Chicago; the city is aiming for 100% renewable energy use in all municipal buildings by 2025. That also means that city-funded buildings will be designed with sustainability at the core. This emphasis on sustainable design is true for all green cities around the world. Homes with solar panels, public spaces with extensive recycling options, and even airports with runoff reduction systems can all be found in these cities. Sustainable design is an integral part of the landscape, and that shows in the super-green buildings that populate these cities. 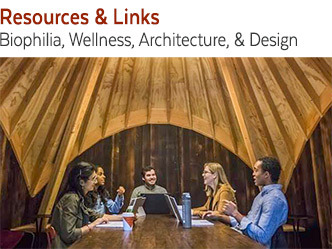 As architects and designers address broader complex societal issues like sustainability, well-being and happiness, community engagement, and social equity, they enter into new territories to create striking and effective buildings that fill green cities. These green buildings are elegant solutions that are often highly biophilic. Since natural building materials tend to be environmentally friendly choices, they appear prominently in these structures. Reclaimed wood, recycled steel, and cross laminated timber are just a few green building materials that can be found in sustainable buildings. The Boston Public Library is a stunning example of gorgeous sustainable design. 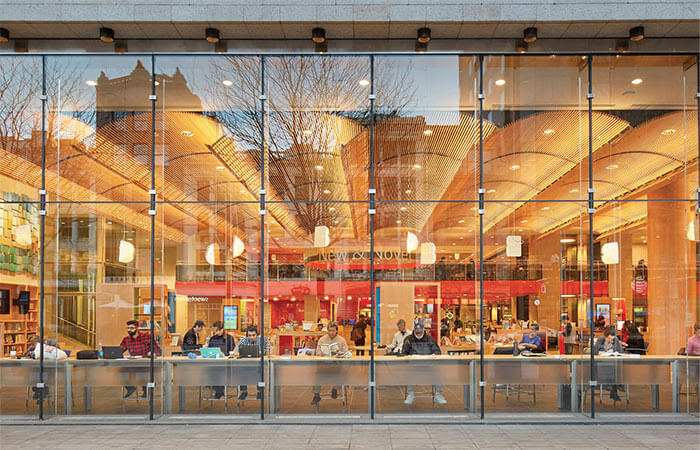 Boston is widely acclaimed as a particularly green city, and its library is no exception. 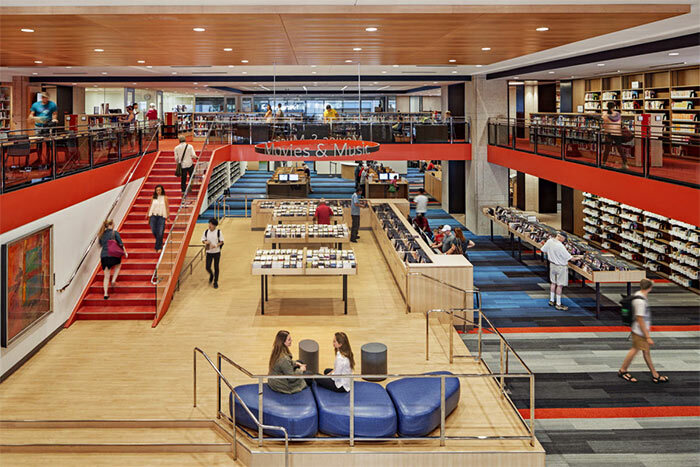 In 2016, architecture firm William Rawn Associates completed a series of renovations that enhanced the library’s sustainability. Natural and LED lighting replaced traditional, high-energy lighting; low-flow plumbing was installed; and energy-saving airflow systems were employed. The result is a building that looks good and does good, mitigating the amount of energy it consumes from the surrounding environment. One reason building design is a priority for green cities is because traditional buildings are extremely taxing on the environment. Commercial buildings are usually the biggest contributor of carbon emissions for a city and account for 19% of total US energy use. However, by using sustainable design, buildings can reduce their energy consumption by as much as 80 percent. Building standards are joining the movement as well, with programs like LEED, Living Building Challenge and Passive House setting the bar for energy efficiency. Many architects are thinking outside the box to come up with unusual and innovative methods to reduce a building’s energy use and overall footprint. 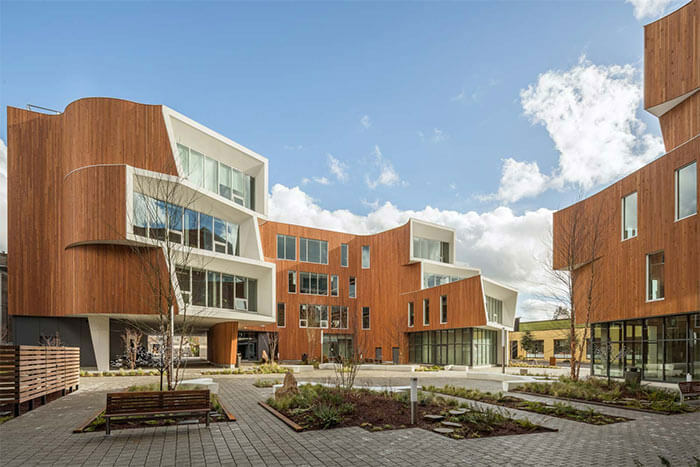 Pictured below is One North, a mixed-use development in Portland (one of the greenest cities in the US) that’s a marvel of sustainability. Its curves, overhangs and apertures may seem merely cosmetic, but they actually maximize both sunlight and shade where each is needed, saving on energy costs by leveraging the power of nature. It’s this sort of forward-thinking sustainable design that ensures the goals set by green cities become realities. Between the Green Cities movement backed by Earth Day and the increasingly rigorous standards of sustainability programs like LEED, the world is quickly moving toward better sustainability in design. As more and more cities turn green, the environmental benefits of sustainability will be intensely magnified, and our world will become much cleaner and healthier. The green city movement is the future of civic design. Today’s green cities have taken on a daunting task––to mitigate the effects of climate change––and they’re accomplishing that goal remarkably. Green building materials, waste reduction systems, and energy positive structures are becoming the new norm. It’s inspiring to think about how different cities will look in the next few decades.